In Greek mythology, the witch Circe was the daughter of the sun god Helios and the ocean nymph Perse (or Perseis). According to legend, Circe lived on the island of Aeaea, where she built herself a palace and practiced spells that enabled her to turn men into animals. 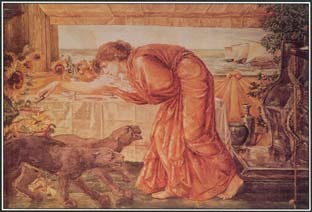 This painting from the 1800s by Edward Burne-Jones shows Circe preparing potions while waiting for Odysseus. Circe first tried to cast a spell over Odysseus and his men by using enchanted food and drink to turn them into animals, but she later assisted them in their journey home. The two best-known legends involving Circe concern her encounters with the fisherman Glaucus and with Odysseus*, a Greek hero of the Trojan Warf. Glaucus was changed into a sea god one day while sorting his catch. He became half man and half fish, with long strands of seaweed for hair. Glaucus fell in love with a beautiful girl named Scylla, but she was frightened of his appearance and rejected him. He went to Circe and asked for a spell to make Scylla love him. Circe offered Glaucus her love instead, but he refused to have anyone but Scylla. The jealous Circe then enchanted the water where Scylla was swimming, turning her into a horrible sea monster with six heads. Scylla fled to a cave on top of a dangerous cliff and attacked any sailors that came within her reach. The most famous tale concerning Circe appears in Homer's Odyssey *. Odysseus and his crew sailed by Aeaea as they were returning from the Trojan War. Odysseus sent some men ashore, led by a warrior named Eurylochus. The group came upon Circe's palace, which was surrounded by lions, bears, and wolves that were tame and did not attack them. In fact, the beasts were men Circe had changed into animal form. Circe then appeared and invited Odysseus's men inside to dine and drink. Everyone accepted the invitation except Eurylochus, who was suspicious. After eating Circe's enchanted food, the men all turned into pigs. Eurylochus alone returned to the ship to tell Odysseus what had happened. Odysseus decided to go to Circe himself. Along the way, he met a young man, who was actually the god Hermes* in disguise. Hermes tried to discourage Odysseus from continuing on to the palace, but Odysseus was determined to get his men back. Hermes then gave Odysseus an herb that would protect him from Circe's spells. When Odysseus reached the palace, Circe invited him in and attempted to enchant him. However, the herb protected him against her spell, and he drew his sword and threatened her. The sorceress fell to her knees and pleaded for her life. Odysseus agreed to spare her if she would return his men to their normal condition and release them safely. Circe restored the crew to human form and offered to entertain them before they returned to sea. Odysseus and his men found life on the island so pleasurable that they remained there a full year before resuming the journey home. When they finally left, Circe sent them on their way with a favorable wind and advice about how to avoid the many dangers that lay before them. In an Italian version of this legend, Circe and Odysseus had three children: Telegonus, Agrius, and Latinus. Telegonus traveled to Ithaca to seek his father but then killed him by accident. He brought Odysseus's body back to Aeaea, accompanied by Odysseus's widow, Penelope, and their son Telemachus. Circe made them all immortal and married Telemachus, and Telegonus married Penelope. Circe also played a role in the legend of the Argonauts*, cleansing Jason* and Medea* after they killed Medea's brother. Many scholars view Circe as a symbol of the luxury and unchecked desire that seduces people and causes them to ignore their duty and thus lose their dignity. See also Nymphs ; Odysseus ; Odyssey, the . Isn't Circe immortal? I dont know but who are her parents?